***This post contains affiliate links. If you click on one and make a purchase, I make receive a small commission, at no cost to you! *** How is it possible that Easter is a week away? I couldn’t let it pass without an Easter DIY! 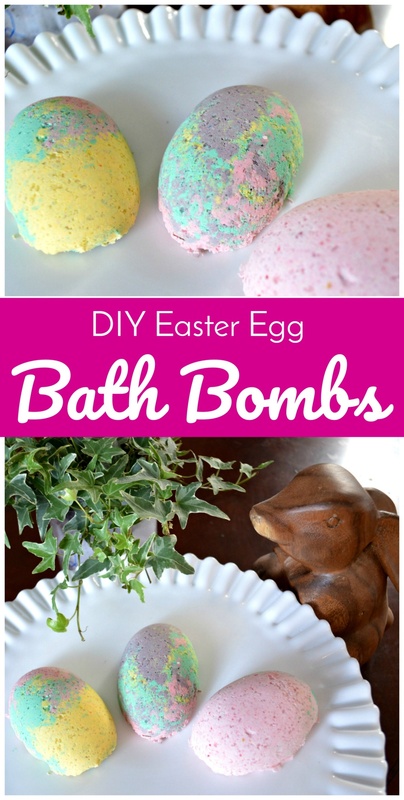 I’ve been meaning to try DIY Bath bombs and plastic Easter eggs seemed like they would be the perfect mold for bath bombs (they weren’t, but we’ll get to that in a minute!). I had a bit of trial and error with these, so I hope I can narrow in on the best method for these DIY Easter Egg Bath Bombs. Fair warning, these were pretty messy to make, but they came together quickly, about 30 minutes plus an hour to sit in the mold. You should let them dry overnight, but I just couldn’t wait and tested one out a few hours after I made them. In a medium size bowl, mix together your dry ingredients. In a separate bowl, mix together the wet ingredients, except for the food coloring. If you want to have more than one color in your bath bomb, separate the dry ingredients equally into separate bowls. I made pink, yellow, green and purple, so I needed four bowls. Start adding your wet ingredients, stirring until well mixed, one tablespoon at a time until it starts to get clumpy. You can add the food coloring at this time as well. You know you have added enough wet ingredients when the mixture is somewhat dry, but will stick to the side of the bowl if you press on it with the back of your spoon. If you accidentally add a little too much of the wet ingredients, sprinkle in a little more corn starch. Repeat this for each color, separately. Smoosh your mixture into your soap mold. I initially wanted to use plastic Easter eggs for this, but I was not able to get the mixture to form together into one egg shape, so I improvised and used the oval shapes of this soap mold. I added the colors in what was supposed to be three separate stripes, but things kind of mixed together and I am totally fine with that. Allow to rest in the soap mold for about an hour and then gently tap it out of the soap mold. Allow to dry overnight. Pop it in your bath tub and watch it fizz! I haven’t taken a bath in a long time, but this bath bomb is next level stuff. It smelled amazing, it made my skin feel amazing. Honestly, I was skeptical about how these would turn out, but this is something that I will definitely make again and it’s something I would also give as a hand made gift. Give them a try and pamper yourself with a bath! Such a cute treat for Easter, or any time of year! Love this simple recipe too.